Some properties of β-galactosidase extracted and purified from Kluyveromyces lactis isolated from a yoghurt waste site were investigated. The crude β-galactosidase isolated from Kluyveromyces lactis was purified by ammonium sulphate precipitation and DEAE-Sephadex ion exchange chromatography. Specific activity of the partially purified enzyme was 107.50 μmole/min/mg of protein and a 7% yield. The molecular weight of the enzyme was 199 kDa as determined by gel filtration on Bio-gel P-200. The Michealis-Menten constant (Km) and maximum velocity (Vmax) value obtained was 3.56 ± 0.62 mM and 0.61 ± 0.08 μmole/min/ml for the enzyme with ortho-nitrophenyl-β-D-galactopyranoside (oNPG) substrate while the Km and Vmax was 18.01 ± 0.23 mM and 0.15 ± 0.04 mmol/20 min/L with lactose substrate. The optimum pH of purified enzyme was 7.5 and 6.5 with oNPG and lactose substrate respectively. The optimum temperature was 40°C with both substrates. This β-galactosidase may have applications in the conversion of whey a by-product of dairy industries into useful products. Whey is the aqueous fraction of milk generated as a by-product of dairy industries. The biggest pollution contributors in the dairy industry are the cheese, yoghurt and ice cream factories. Whey contains approximately 0.4-0.5% butterfat, 0.6-0.8% soluble protein, 4.5-5% lactose, minerals, trace amount of vitamins, and other organic matters . Most dairy plants separate butterfat for use as an ingredient for further processing. The remaining whey may be made into various products such as condensed or powder whey, lactose and whey-protein concentrate by using an array of processes or otherwise disposed of. Disposing of surplus whey in the environment is problematic because of its high organic content with high Biochemical Oxygen Demand (BOD) and high Chemical Oxygen Demand (COD) . Continuous land disposal of whey can endanger the physical and chemical structure of soil, decrease crop yield and lead to serious water pollutions . To overcome these complications, recent research attempts try to deal with the problem by focusing on the development of technologies that employ whey as raw material to produce useful products. One of such technologies is the hydrolysis of lactose in whey by β-galactosidase to produce low or non-lactose milk for lactose intolerant people and concentrated and frozen dairy products. β-galactosidase has also been used in the up grading of whey as ingredients of food and feed and in the production of sugar substitutes from permeate . Hydrolysis of whey and their derivative expands their use as fermentation medium and for the production of fodder yeast bio-ethanol and other commercially important microbial metabolites. β-galactosidase (β-D-galactoside galactohydrolase, EC 3.3.1.23) can be obtained from a wide variety of sources such as microorganisms, plants and animals tissues [5,6]. Enzymes from microbial sources are of great technological interest. Microbial enzymes have been reported to offer various advantages over other sources such as easy handling, higher multiplication rate and production yield and do not contain potentially harmful materials. As a result of commercial interest in β-galactosidase, a large number of microorganisms have been investigated for their production . Among these fungi are the preferred candidates for industrial production of enzymes  and yeasts have been considered the predominant microbial source for food application because they as safe (GRAS). This study was aimed at isolating, purifying and characterising β-galactosidase from a yeast strain (isolated from yoghurt waste site) capable of hydrolysing lactose for possible biotechnological application. Kluyveromyces lactis previously isolated from yoghurt waste site samples and reported to hydrolyse lactose  was cultured in 100 mL of yeast peptone lactose broth (YPLB) at 25°C for 24 h on a rotary shaker. About 30 mL of the YPLB culture was used to inoculate 3 L of freshly prepared YPLB and incubated at 25°C on a rotary shaker at 100 rpm for 24 h. The yeast cells were harvested by centrifugation at 6000 rpm for 15 min at 4°C. About 40 mL of reconstituted yeast cells suspension in sterile YPLB broth was lysed with 200 mL of cold Z buffer (0.10 M sodium phosphate buffer, 10 mM KCl, 1 mM MgSO4 and 50 mM 2-mercaptoethanol, pH 7.0 containing 20 μl of 0.1% SDS and 40 μl chloroform) with the use of fine sand and mortar in a mortar and pestle. The mixture was centrifuged at 6000 rpm for 15 min at 4oC to obtain the crude enzyme (supernatant). β-galactosidase activity was assayed by measuring the hydrolysis of the chromogenic substrate, o-nitrophenyl-β -Dgalactopyranoside (oNPG) using the Miller (1972) method . The β-galactosidase activity was determined by incubating 1 mL of Z buffer, 0.2 mL of 4 mg per ml oNPG (in 0.01 M sodium phosphate buffer, pH 7.2) and 5 λ amount of enzyme at room temperature for 10 min. The reaction was terminated by the addition of 0.4 mL of 1.0 M Na2CO3 to the reaction mixture. The optical density was read at 420 nm in the spectrophotometer. One unit of the enzyme activity was defined as the amount of enzyme required to liberate 1.0 μmol of nitrophenol in 1 min. The protein concentration was determined by the method of Bradford (1976)  using bovine serum albumin (BSA) as standard. Crude enzyme (200 mL) was brought to 65% ammonium sulphate precipitation saturation. The precipitate was collected by centrifugation, dialysed against several changes of 50% glycerol in 0.1 M sodium phosphate buffer, pH 7.0 and further purified on DEAE-Sephadex ion-exchange column. Elution was with 0.1 M sodium phosphate buffer, pH 7.0 at a flow rate of 60 ml/h and the proteins were eluted with a linear gradient of 0-0.5 M NaCl. Polyacrylamide gel electrophoresis was performed in the absence of SDS to test for the homogeneity of the enzyme preparation. This was performed according to the method described in the Pharmacia’s Manual (Polyacrylamide Gel Electrophoresis, Laboratory Techniques, Revised Edition, Feb 1983) on 7.5% rod gel. Electrophoresis was carried out in 0.1 M sodium phosphate buffer, pH 7.0. The apparent molecular weight of the purified β-galactosidase was estimated by gel filtration on a column (2.5 x 80.0 cm) of Biogel P-200. The column was calibrated with bovine serum albumin (MW 66,000 da; 5 mg/ml), ovalbumin (MW 45,000 da, 5 mg/mL), γ-globulin (MW 150,000 da; 5 mg/mL), pyruvate kinase (MW 230,000 da; 5 mg/mL) and creatine phosphokinase (MW 88,000 da; 5 mg/mL) [12,13]. The kinetic parameters [Michealis-Menten (Km) and maximum velocity (Vmax)] of the enzyme were determined in 0.1 M sodium phosphate buffer, pH 7.0 containing 10 mM KCl and 1 mM MgSO4, with varying concentration of oNPG from 1 mM to 10 mM. Incubation was at 37°C for 10 min before the reaction was stopped with 0.4 mL of 0.1 M Na2CO3. With lactose as substrate, the kinetic parameters of the enzyme were determined in modified Buffer B (Potassium phosphate buffer, pH 7, containing 20 mM NaCl and 2 mM MgCl2 as described by Kim et al. with varying concentrations of lactose from 20 mM to 100 mM. The assay was performed with 0.1 mL enzyme and incubated at 37°C for 20 min after which the reaction was stopped by boiling the assay mixture for 5 min. 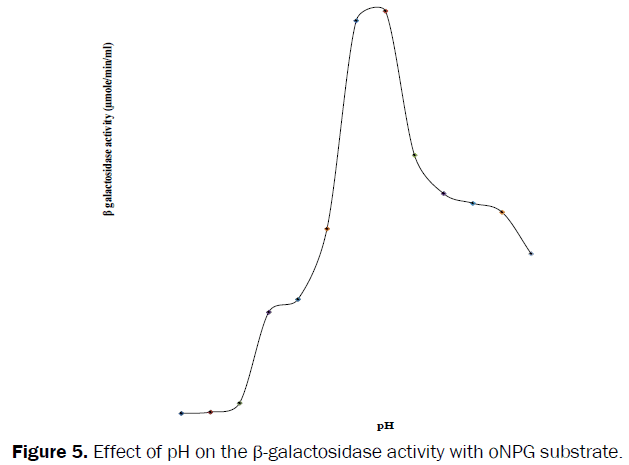 β-galactosidase activity was measured by a quantitative analysis of glucose release determined by adding 2 mL of the glucose reagent from glucose oxidase kit. The absorbance was measured at 500 nm. One unit of enzyme activity was defined as the amount of enzyme that produced one μmol glucose per min under the defined conditions. The optimum pH of β-galactosidase with oNPG substrate was determined by measuring the enzyme activity using buffers of 0.05 M but with varied pH. The buffers used were acetate (pH 4 - 5.5), sodium phosphate (pH 6.0 - 7.5), Tris (pH 8.0 - 9.0) and borate (pH 9.5 and 10.0). The reaction mixture contained 1 mL of each buffer, 0.2 mL of oNPG solution and 0.05 mL of the enzyme and incubated for 10 min at 37°C. The reaction was terminated by adding 0.4 mL Na2CO3 to the reaction mixture and the absorbance read at 420 nm in a spectrophotometer. With lactose as substrate, the optimum pH for the enzyme was determined by incubating 1 mL of each buffer, 0.5 mL of 20 mM lactose and 0.2 mL of the enzyme for 20 min at 37°C. The reaction was stopped by boiling assay mixture for 5 min and 2 mL of glucose reagent was added to it after which the absorbance was read at 500 nm. The optimum temperature on β-galactosidase activity was determined with oNPG and lactose substrates at the varied temperature of 10°C to 70°C. With oNPG substrate, 1 mL Z buffer and 0.2 mL of 20 mM oNPG were initially pre-incubated in water bath at stated temperature for 10 min, after which 0.05 mL enzyme was added and incubated at the same temperature for another 10 min. With lactose as the substrate, 1 mL buffer B and 0.5 mL 200 mM lactose were pre-incubated at varied temperatures for 10 min, after which 0.2 mL enzyme was added and reaction mixture was incubated at the temperatures for 20 min. β-galactosidase obtained from Kluyveromyces lactis isolated from yoghurt waste site was purified to a yield of 7% and specific activity of 107.50 μmole/min/mg of protein. The elution profile on DEAE-Sepahdex is presented in Figure 1. Electrophoresis in the absence of SDS on gel rods showed two visible protein bands after the ion-exchange step. All attempts to use gel filtration of various resin on Sephadex G-200, Sephacryl 200 and 300 to separate the two proteins resulted in a considerable low yield. The molecular weight of the enzyme was estimated to be 199 kDa as presented in (Figure 2) which is comparable to that of the yeast, Candida torulopsis, which was 214 kDa [14,15]. It is also comparable to the molecular weight 240 kDa of the enzyme isolated from Streptomyces solfataricus . The Km values of 3.56 ± 0.62 mM and 18.01 ± 0.23 mM obtained for the enzyme with oNPG and lactose substrates in Figure 3 and Figure 4 respectively were also comparable to the Km values of 1.7 mM and 17.3 mM obtained for oNPG and lactose from a commercial preparation of the enzyme from Kluyveromyces lactis . However, the Km value for lactose was lower than the value of 36.31 mM obtained for the enzyme from Bacillus polymyxa  and the value of 25 mM obtained from Kluyveromyces marxianus . The optimum pH of the enzyme was 7.5 (Figure 5) and 6.5 (Figure 6) with oNPG and lactose as substrate respectively. These values are comparable to that of the enzyme from Bacillus stearothermophilus which gave a maximum activity at pH 7.0 . The optimum temperature of the enzyme activity with both oNPG and lactose substrates was 40°C as shown in Figure 7 and Figure 8 respectively. This is almost similar with the optimum temperature of the enzyme obtained from a recombinant Escherichia coli with K. lactis gene, which was 37°C and 40°C when oNPG and lactose respectively were used as substrate . It is also comparable to the optimum temperature of 45°C obtained for same enzyme from Aspergillus japonicas . Figure 2: Calibration curve for the determination of molecular weight of β-galactosidase by gel filtration on Biogel P-200. Figure 3: Lineweaver-Burk plot for the determination of kinetic parameters for the β-galactosidase activity with oNPG substrate. Figure 5: Effect of pH on the β-galactosidase activity with oNPG substrate. Figure 6: Effect of pH on the β-galactosidase activity with lactose substrate. 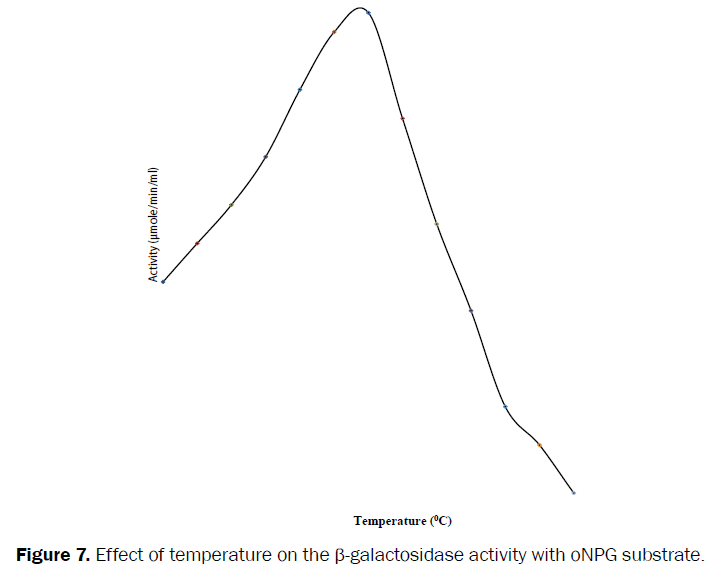 Figure 7: Effect of temperature on the β-galactosidase activity with oNPG substrate. Figure 8: Effect of temperature on the β-galactosidase activity with lactose substrate. It could be concluded that Kluyveromyces lactis isolated from yoghurt waste site is a potential candidate for the production of β-galactosidase. The properties of the enzyme suggest its possible use in the conversion of dairy waste into economically useful products. Siso MIG. The biotechnology utilisation of cheese whey: a review. Biores Technol. 1996; 57: 1-11. Ghaly A. E. and M. A. Kamal. Submerged yeast fermentation of acid cheese whey for protein production and pollution potential reduction. Water Res. 2004; 38: 631 – 644. Mohan SVL, et al. Anaerobic Biohydrogen production from dairy watewater treatment in sequencing batch reactor (AnSBr): Effect of organic loading rate. Enzyme and Microbial Technol. 2007;41: 506-515. Illanes A, et al. Immobilization of lactase for the continuous hydrolysis of whey permeate. Bioprocess Biosyst Engr.1990; 5: 257-262. Grosova Z, et al. Perspectives and Applications of immobilised βetagalactosidase in Food Industry –a Review. Czech J Food Sci. 2008; 26: 1-14. Panesar PS, et al. Potential applications of immobilized β-galactosidase in food processing industries. Enzyme Research. 2010. Mathew GM, et al. Progress in research on fungal cellulases for lignocellulose degradation. J Scientific Industrial Res.2008;67: 898-907. Oluwanyi TT. Purification and Characterization of β-galactosidase from a yeast isolated from a yoghurt waste site in Ibadan, Oyo State, Nigeria. M.Sc. Thesis, ObafemiAwolowo University, Ile – Ife, Nigeria. 2011; Pp: 133. Miller GL. Experiments in Molecular Genetics. Cold Spring Harbor Laboratory Press, Cold Spring Harbor, New York, 1972; p:352. Bradford MM. A rapid and sensitive method for the quantification of microgram quantities of protein using the principle of protein-dye binding. Analytical Biochemistry. 1976; 72: 248 – 255. Andrews P. Estimation of molecular weights of proteins by sephadex gel filtration. Biochemical J. 1964; 91: 222- 233. Andrews P. The gel filtration behaviour of proteins related to their molecular weights. Biochemical J. 1965; 96: 595-606. Kim CS, et al. Expression and characterisation of Kluyveromyceslactisβ-galactosidase in Escherichia coli. BiotechnolLett. 2003; 25: 1769-1774. Itoh T, et al. Production and Charaterisation of β-galactosidase from lactose fermenting yeasts. AgricBiol Chem. 1982; 46: 899-904. Grogan DW. Evidence that β-galactosidase of Sulfolobussolfatancusis only one of several activities of a thermostable a-D-glycosidase. Appl EnvironMicrobiol. 1991; 57: 1644-1649. Cavaille D and D Combes. Characterisation of β-galactosidase from Kluyveromyceslactis. Biotechnol. Biochem. 1995; 22: 55-64. Chakraborti S, et al. Production and partial characterisation of a novel βgalactosidase from a newly isolated Bacillus polymyxa. ScientiaIranica.2003; 10: 279-286. Gonclaves JA and FJ Castillo. Partial purification and characterization of β-galactosidase from Kluyveromycesmarxianus. J Dairy Sci. 1982; 65: 2088-2094. Chen W, et al. Immobilisation of recombinant β-galactosidase from Bacillus stearothermophilus for lactose hydrolysis in milk. J Dairy Sci. 2009; 92: 491-498. Saad RR. Purification and some properties of β-galactosidase from Aspergillus japonicas. Annals Microbiol. 2004; 54: 299-306.